This article by Sarah Hartley and Warren Pearce was first published on the LSE Impact Blog on 14 November, 2016 and is republished here under a CC BY 3.0 licence. What is science for? One answer to this might be “to answer questions about how the world works”. Sounds simple, but packed into these eight words are a multitude of complexities, values and politics about how society organises the practice of scientific enquiry including, crucially, how to decide which questions to answer, and which ones are left neglected. As Heather Douglas has noted, there has been an historic tension between classical notions of scientific autonomy, in which researchers pursue their own curiosities about how the world works unfettered by managerial oversight, and the notion that researchers have general responsibilities to society, particularly in the context of the extensive public funding of science. Since the financial crash, public funding has increasingly come with ‘strings attached’, notably that scientific innovation should drive economic growth. For example, the “eight great technologies” that were a focus for UK government funding under David Cameron’s leadership. In recent years a counter-trend has emerged. ‘Responsible research and innovation’ (RRI) is a policy tool to shape the direction and purpose of science, technology and innovation as a means to achieve public value beyond the pre-eminent goal of economic growth. RRI gained prominence in the UK, through the EPSRC (the UK’s largest research funding body), and the EU, through Horizon 2020. While precise definitions of RRI differ across these and other institutions, the emergence of RRI has provided a forum for addressing the thorny, political issues that are attached to publicly funded science. In particular, RRI calls for sustained inclusion of interested groups and members of the public in the research and innovation process, and increased capacity for researchers to respond to the comments and concerns of these groups. While the underlying ethos of RRI is relatively clear, research councils do not offer guidance to university researchers about how to put the RRI framework into practice. This situation has given researchers plenty of opportunity to interpret the framework and ascribe their own meanings. As RRI became more mainstream in 2014, we looked closely at how it was interpreted and practised within one research-intensive UK university, using document analysis and interviews with key researchers and administrators. Our research highlights two crucial aspects of RRI that are underdeveloped in the academic literature yet fundamental to understanding its future development. First, RRI has multiple meanings embedded within it and these meanings matter for implementation within universities. Second, RRI provides an opportunity to think about political issues in research. This does not mean that scientific research becomes skewed or biased, but it does mean that ‘small p’ political issues may emerge in various sites, such as labs, committee meetings or public engagement events. RRI can recognise and address these political issues when it becomes, in the words of Mark Brown, “a site of politics”. We found that the emergence of politics depends on the particular meanings of RRI intersecting with actors’ acknowledgement of their general responsibilities to society. Training and education of scientists and students – embedding a particular meaning of RRI over the long term. Within each of these meanings we also identified whether actors did or did not acknowledge their general responsibilities to society and argue these responsibilities are a key factor in the practice of RRI. First, role responsibilities are specific to professional status; and second, general responsibilities extend beyond researchers’ professional ambit to the rest of society. General responsibilities imply a collective approach to issues such as the shaping of scientific agendas to address ‘grand challenges’, how to think about innovation in terms of values rather than consequences, and how to institutionalise responsiveness to the public. Our research shows that actors’ acknowledgment of their general responsibilities opens pathways via which political questions about scientific research can be addressed. 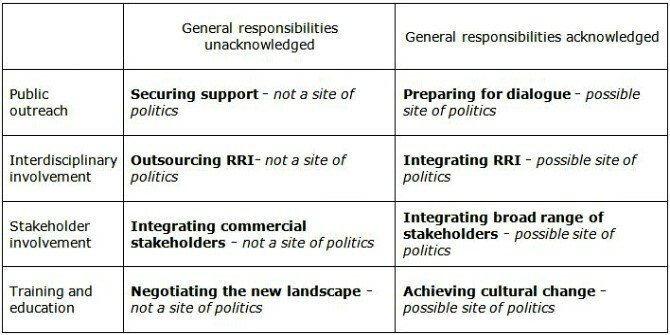 The table below shows how these pathways develop from the four meanings of RRI, and the alternative pathways that arise when general responsibilities are not acknowledged. Universities are a key site for the struggle between meanings that will determine the development of RRI. Yet our results reveal a lack of imagination about what RRI might look like in practice, even by those actors who acknowledged their general responsibilities to society. The challenge for UK universities is to build on successful project-level RRI activities to develop institutional responses to the RRI agenda, particularly how to protect the notion that science should deliver benefits to society beyond wealth creation. Case studies of successful RRI implementation can help to address this by developing shared understandings of RRI through mutual learning between disciplines. This may help to bring greater understanding and coherence of meaning between different perspectives, moving away from abstract governance concepts in order to help actors imagine what responsibility might look like in practice. Significant challenges remain, such as resource availability and disciplinary traditions, but it is in the interest of all actors to get a grip on the notion of general responsibilities; failing to do so will likely lead to greater external oversight at the expense of scientific autonomy. Sarah Hartley is a Senior Lecturer at the University of Exeter Business School where she researches the governance of science, technology and innovation as it moves from the lab to commercialisation. Her current work examines the responsible development of GM insects, gene drive and genome-editing. She tweets at @Sarah_A_Hartley. Warren Pearce is Faculty Fellow (iHuman) within the Department of Sociological Studies, University of Sheffield. He researches the relationship between science, policy and publics, with a current focus on two main themes: public inclusion in research governance, and climate change communication and policy. He tweets at @WarrenPearce. 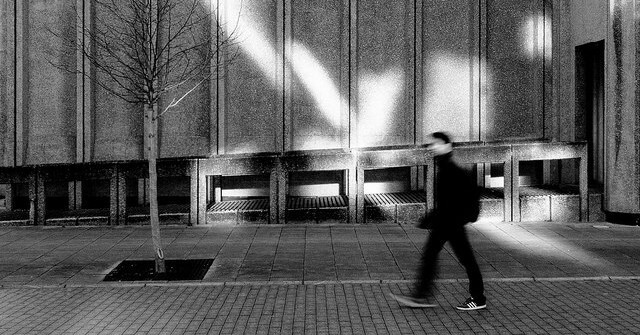 Image credit: One Step Forward by Mike Kniec. This work is licensed under a CC BY 2.0 license.